Last night, we did my last campaign speech…at least for this campaign! It was at the retirement community where Erika works as The Director of Enrichment. I spoke there about a year ago delivering one of my first campaign speeches. A lot has changed between the 2 appearances, both in the outside world, but especially in their world…and NOT change for the better. Their community was just bought from a family-owned non-profit by a big for-profit corporation. This corporation doesn’t value “enrichment,” “community,” or the people [the residents and the staff alike] who have been there for many years. Instead it is in the process of removing the older people and going after a younger [richer] crowd who would require less care, hence less costs, hence bigger profits. This was the context in which the standing room only audience took what I was saying. Last year they got what I was saying. But this year, everything was more intense, real, and personal. We were describing how things should be, how we could get there in very practical terms. I did my longer speech, but almost everybody in the room stayed engaged. What a finale for the campaign! It was really fun to be back at the Claremont again, setting up for another campaign event! Kit was around too, finishing off his day of work ... It was really fun to decorate ... the last hurrah! Election night would be the last event of this amazing campaign ... unless of course Frank won!!! 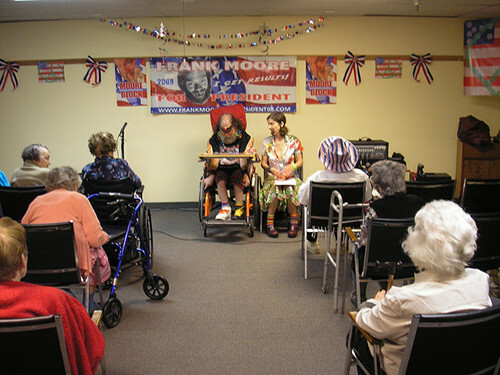 And then the speech was over, and everyone was invited to have milk and cookies ... And Frank and Linda chatted with Ruth up front, who really enjoyed Frank's speech, and liked wearing the red, white & blue cowboy hat, and liked that she would be on public access tv! And then the evening melted into a deep, soft concentrated conversation with Carol ... a woman we found out later is around 97 years old ... she wanted to know more about Frank, and Linda, and how we all live, what Frank's daily life is like ... it was so deep and moving on so many levels ... Linda said later it was felt like "one body" with Carol ... She just kept asking questions ... and was really moved and impressed and fascinated with Frank ... She used to live in our neighborhood, was a teacher ... they got to know each other ... she got to hear all about Frank's daily routine, what you do "for fun", basically what Frank's day is like ... It was so powerful after hearing Frank's presidential plan, to hear about your/our life so intimately, and to feel it resonate so deeply in Carol ... And then later, we were talking about the level of how Carol would repeat questions, but it never felt like it was the same question ... more like rubbing a wood carving in a certain place deeper and deeper to get to the deep feeling of the carving. And how because you didn't get into the repeating of her questions in the way that people might commonly perceive them, that it transformed not only the conversation, but the whole notion of aging, and communicating with older people ... the whole thing was very transformative! It was so neat how you talked about your days ... longer than 24 hour days, and how Carol really appreciated this, and then there was the level of how she asked Frank so much about how he gets around, and can he walk, and does he mind sitting for long periods of time...? ... we only found out later that she was confronting issues with her own need for a wheelchair, and so hearing how Frank enjoyed his life so fully, even though he was usually sitting, in one form or another, must have had quite an effect on her ... It was really really fun, and deep. Kit was back from putting up flyers and he helped set up the cookies with red, white and blue napkins!!! The decorations looked great and soon you arrived, just in time. The residents were chatting, "Where is the toothless wonder?" "Who is this Guy Frank Moore?" And then he arrived. Frank started right in with his speech telling everyone that they could interrupt at any time with questions and comments. The room was sucked into his speech, everything dropped down deep and they were ready to listen. There was a little chatter throughout but the feeling in the room was they were right there with him going into the world that he was creating through his speech/platform, especially in the parts that were about health care, and that everything they needed including all their expenses to live in a retirement community would be taken care of, wow!! Then there were some questions and comments and Sidney said that she was noticing changes in the Monarch Place, that going from a non-profit to a profit business changes the feeling and that they had gotten rid of their nurse and Frank said to cut costs, to make more of a profit and that health care should not be for profit. There were a few more questions and comments and then we served up some Paul Newman's cookies and milk and most of the crowd left the room but before that time it was packed!!! A couple of residents stayed including Carol and Helen. Carol had questions about our life at home and how Frank spends his days and how he gets around and at times she repeated questions each time taking us down a different road, what do we do for fun, how do we spend our days, where do we live, does Frank walk, how does he get around the house. She was amazed by it all and impressed with all that we do including Frank's 48 hours performances!!! What an amazing night, what a great audience, what fun!! We started to clean up taking down the decorations etc. and soon headed home still talking about the night, the amazing conversation with Carol how ready for the speech everyone had been, how powerful the parts were that went directly into the lives of the residents. We got there and started decorating. Every now and then someone would poke their head in and say hi. A lot of people were looking for Erika. The place felt good. Once the room was done it filled up fast. Erika and I went around with consent forms and then you guys showed up and got ready in no time. The feeling there was very full and fun. Everyone taking in what Frank was saying, what his speech was about on a deep level. Even the comments and the joking was part of the fun. A lot of people felt what it would mean to them if Frank was president, how that would stop the for-profit bulldozer. There were serious candidate questions like what is his stance on abortion and gay marriage. His answers sunk in. It was very real and deep how Frank spoke to the people as himself, not some glossed over image of who he wants them to believe he is. After the speech people stuck around and had cookies and milk. They felt good, cozy. Then we had a great talk with Carole and her friend when everybody else had gone. She was so innocently curious as to how Frank lived. Her questions cut through everything and lead down different paths each time she asked them again. Finding out something new every time. Rubbing deeper into us. Everyone having a really great time just being there. It was a wonderful last campaign stop.